The Convenience Store business is very competitive. Gas is low margin, so in store sales really help pay the rent. 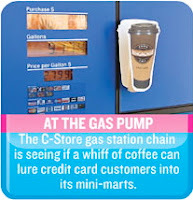 Now a clever entrepreneur wants to pump the smell of coffee into the forecourt (that's the industry term for the areas around the gas pump). From a marketing standpoint, it's a great idea. Smell is a very powerful trigger of deep seeded emotional response. And coffee is an impulse buy that's high margin. Business 2.0 also reports that Wal-mart will sell "smell-a-vision" kits with certain DVDs. Again, interesting. But does no one else see the first asthmatic who chokes on these smells winning the lawsuit lottery?